Before he became one of the top defensive ends in professional football; before he earned two Super Bowl rings; before he climbed Mt. Kilimanjaro; before he established a foundation that brought clean water to African villages; before he was celebrated (and vilified by some) as one of the first white allies to publicly support black teammates in their protests of police abuse; before he had a sandwich named after him at Littlejohn’s – Chris Long was one of them. 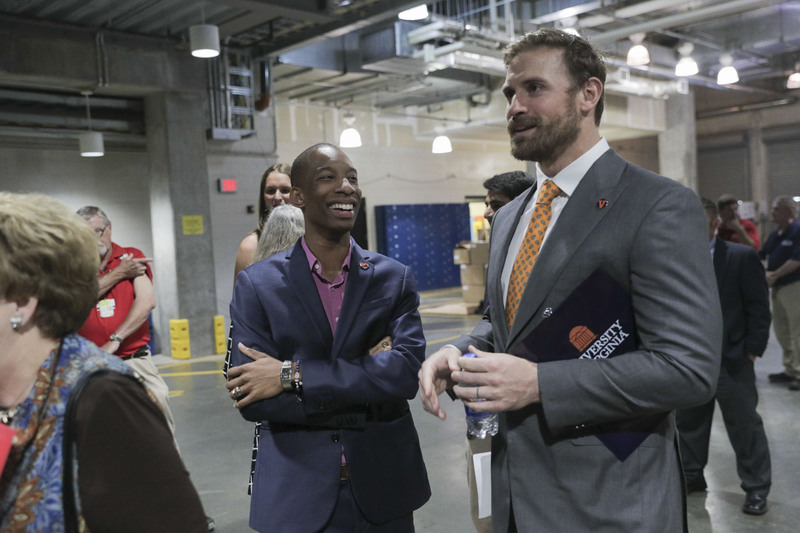 Like the soon-to-be University of Virginia graduates he addressed Friday afternoon at Valedictory Exercises in the John Paul Jones Arena, Long knew what it was like to walk the Grounds. He slept in the same dorms, wiped the sleep from his eyes in the same dining halls, took many of the same courses with some of the same professors, walked reverently along the Lawn, and ate sandwiches (perhaps named after other people) at Littlejohn’s. 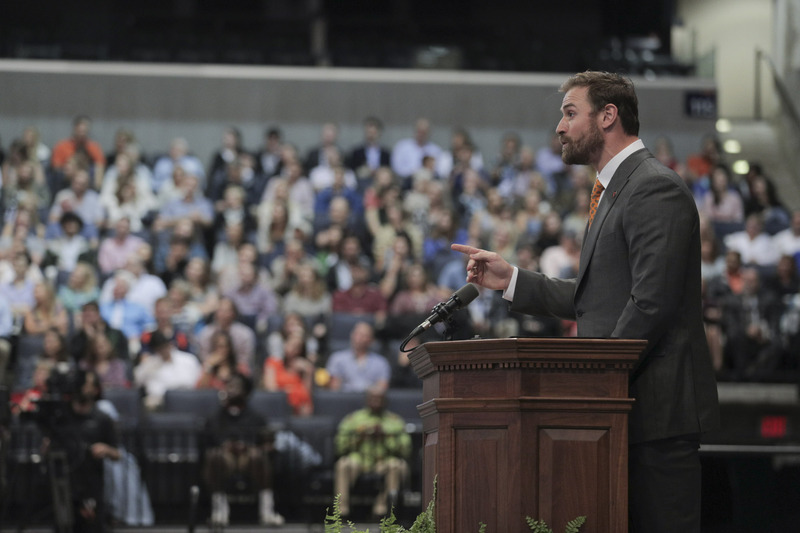 And, as he told the assemblage at JPJ in his humor-punctuated remarks, he shared many of their human fears and anxieties. “I feared not fitting in here in a community of brilliant minds, when the biggest thing I bring to the table is playing a violent game,” he said. “I was scared to talk to you today. “You’re terrifying people!” he joked. Recounting some of the low points of his football career, he admitted that he once considered transferring from UVA after struggling early in his playing career. He stuck it out and went on to become one of the best players in UVA history, leading to being the No. 2 overall selection in the 2008 National Football League draft. But when the St. Louis Rams released him after eight largely successful seasons, he wondered anew what the future would hold. He quickly had offers to play for other teams he perceived as being less competitive – “I’d be paid well and look successful, but I wasn’t sold,” he said – then took a call from Bill Belichick, the legendary head coach of the powerhouse New England Patriots, offering him a chance to play there. His role on the team would be less secure, Long knew, but “I took a gamble and a year later I was a world champion,” he said, drawing applause. “Before I was a champion, I failed and was afraid. Instead, he urged the graduates to “take bold chances,” even when others perceive them as already being successful. Seeking a challenge, he decided “on a whim” to climb Mt. Kilimanjaro. But beyond satisfying a personal, physical challenge, he also discovered a mission: finding ways to provide abundant, clean water for people in Africa. His Chris Long Foundation began the “Waterboys Initiative,” which has since raised more than $1.5 million toward those efforts. Every summer, he leads retired NFL players and wounded military veterans up Kilimanjaro to call attention to his project. He encouraged the graduating class to seek out similar challenges as they go forward. “Progress is not self-sustaining. Complacency is widespread. Hatred is rampant. What descended upon our community this past August shows, loud and clear, that we haven’t progressed as far as we think,” he said, referring to violent white supremacist rallies on Grounds and in downtown Charlottesville. “It’s a reminder that in times like these, we need people who will rise to the challenge and stand in the storm that’s raging between right and wrong, not sitting back and saying ‘he’s got it, she’s got it.’ We need more people saying ‘I’ve got it.’ And there are plenty of you in the crowd. After Long’s address, as the standing ovation faded and some people headed prematurely for the exits, C. Malcolm Stewart, president of the Class of 2018, took the podium to offer his parting remarks. Stewart recalled his mother’s battle with breast cancer, which began while he was in high school. She cycled through chemotherapy, remissions and recurrences, until she was finally diagnosed during the spring of 2015 – during Stewart’s second semester at UVA – as having the rare “triple-negative” form of breast cancer, for which doctors could offer no treatment and no hope. Nonetheless, she encouraged Malcolm and his siblings to continue their activities. He spent that summer alternating between leading orientation sessions alongside 51 of his peers and making trips home to be with his family. His mother died that July 11, “a moment that will stick with me for the rest of my life,” he recalled. “But equally to that moment is one that came the following week, when I sat down in my church, and I looked up in the pew at the funeral and saw the orientation leaders that I had been working with all summer. They had never met my mom; they had never met my family; and their only connection to coming down there was because of how they had gotten to know me. “And what I learned in that moment is that although there is a seat that will forever sit empty in my family, it is also joined by a hundredfold seats for all of you that I would now equally call my family. “The first … is that it is impossible to deny that the University of Virginia is far from perfect,” he said. “It has its flaws, it has its imperfections, and it has its history. Earlier in the ceremony, which was moved indoors due to rain, the Class of 2018 presented its class gift to UVA President Teresa A. Sullivan. In all, more than 1,400 fourth-year students – about 40 percent of the class – gave $63,597 to more than 400 University organizations and departments. “I’m grateful for your generosity and the many ways your gift will help the University,” Sullivan said. The proceedings also included the presentation of several awards to members of the Class of 2018, and to other members of the University community. Sullivan will be the featured speaker at graduation ceremonies to be held Saturday (for graduates of the College and Graduate School of Arts & Sciences) and Sunday (for the University’s other schools and the Data Science Institute). Both ceremonies, scheduled to be held on the Lawn, will begin at 10 a.m.